According to the National Association of Realtors, about 5.1 million homes will be sold in the United States in 2014. Whether consumers are in the market to buy or sell, Granite Transformations, a global full-service home and business remodeling resource known for its revolutionary resurfacing process, will add value to their homes with a variety of decorative and durable granite, recycled glass and mosaic tile surfaces that reflect the latest trends in home design. “Granite Transformations is the perfect solution for remodeling kitchens and bathrooms quickly and easily without the stress of an average demolition project,” said Carl Griffenkranz, Vice President of Marketing for Granite Transformations. 1. Going Green: Homeowners continue to be environmentally conscious by incorporating sustainable elements into their home design. Granite Transformations has partnered with Kohler to create Terra Chiara and Terra di Siena, an innovative line of countertop surfaces that feature varying flecks of gold, brown, black and white and are made with up to 51% of Kohler, repurposed and pre-consumer porcelain products. Granite Transformations also offers a line of stylish recycled glass surfaces in a variety of colors that look great in any kitchen and keep waste out of the landfills each year. 2. Seeing Red: Home owners and interior designers alike will be drawn to vibrant colors throughout the home this year. Add a splash of red or hints of other hues with an impressive line of mosaic tile to add flair and character to any room in the house. 3. Let The Sun Shine: Reflective tile backsplashes and light granite countertops from Granite Transformations will give any kitchen the illusion of more light and space. 4. Back to Earth: Incorporating earth tones into the kitchen for a tranquil and serene sensation will be popular again in 2014. 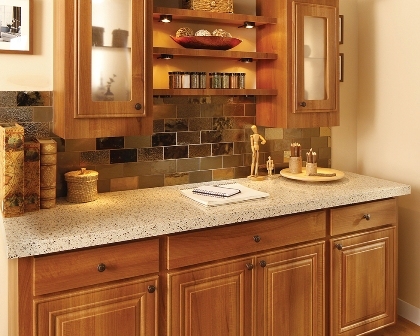 Granite Transformations’ products can give any home a contemporary, yet casual feel. 5. Mixed Metals: Lustrous countertops with metallic influences such as silver fixtures and accents complimented by a mosaic backsplash with 24k gold tiles for a touch of glamour will be on trend for bathrooms. Granite Transformations products can be professionally installed in as little as one day and come with a lifetime warranty on all products, giving customers added peace of mind and unbeatable value. These surfaces are nonporous, incredibly resistant to stains, scratches and heat because they are finished with the company’s exclusive ForeverSeal®, which helps to ensure the lifetime use of the products. Customers also enjoy Granite Transformations’ complimentary in-home design consultations, which allow them to choose products from the comfort of their own home. For more information about Granite Transformations, visit http://www.granitetransformations.com. Granite Transformations, a global full-service home and business remodeling resource, offers an impressive selection of stylish and affordable alternatives to traditional countertops, backsplashes, cabinets, floors and more. Best known for its revolutionary resurfacing process ideal for kitchens and bathrooms, Granite Transformations is meeting the needs of clients with franchise locations throughout the North America, Australia, New Zealand and the United Kingdom. For more information, visit http://www.granitetransformations.com/.